Off the Beaten Path: But I Loved This Book! And I Have a Give-Away! But I Loved This Book! And I Have a Give-Away! I don't generally like novels that take place in the west. I'm an easterner by birth, in my internal clock, and in my heart...even though I live in the West...and like it..but still...I don't like stories about the west. And I don't generally read mysteries. I have no idea why. I just figured there weren't any good ones out there. That's because I am small minded like that. And I don't usually pick up a book I've heard nothing about and read it. I examine the cover carefully, read the comments on Amazon.com, ask around to see if anyone else has read the book, read the jacket profile over and over...until I'm finally convinced the book is worth my while. I think that's because it usually takes me a long time to read a book. I'm a slow reader. Not because I did poorly in reading class or because I'm dyslexic. I'm not. I read slowly because I pronounce each word out in my head. It's like I can hear the book being read in my sick little mind. It reads more like an old-fashioned radio show than a book. I would never speed read. And I like to give my characters different voices. Enough said. So those are all reasons it's a complete miracle I ever read Trouble in Store...in three nights...a real record for me. I normally wouldn't have even picked up Trouble in Store. Although, that's not to say I don't like the cover. I do. I want to borrow her dress, in fact. But I'm so glad I did pick up and read Trouble in Store because I loved this book! Carol Cox has written a sweet (don't fault her there; that's a good thing...sweet), intriguing, and fun (yes, I said fun!) Christian, romantic, historic mystery. And yes, it takes place in the pioneer land of Arizona. And I loved this book! I love the fact that Carol is a Christian fiction author, but her pen does not drip sugar. Know what I mean? This is a real heroine with foibles and faults. But she learns from her mistakes and from the people around her with a humble and simple Christianity. I also love that the books has layers. I won't explain what that means in novel terms, but if you're a reader who likes layers in your books, you know what I mean already. And this book has them. I also like that the characters in this book eat. That's right, I said they eat. It bugs me when characters don't ever eat. I like to eat. I like to eat while I read. Even more. I love it when characters drink hot tea. Then I get to get up and fix me some hot tea, too. Melanie, the main character in Trouble in Store, drinks a lot of hot tea. Thus, I drank a lot of hot tea while reading Trouble in Store. The mystery will keep you going all the way through the book. In the end, you'll look back and see how it all tied together. But you won't be tying the package up all neat before the final chapters. And that's pretty hard to accomplish with me, since I'm a last-chapter-first reader (gasp!). Still, I was surprised when the villain was discovered! If you're looking for an intriguing summer read, I highly recommend Trouble in Store by Carol Cox. You can get yours here. Happy reading! PS - right now Carol has a Sweepstakes going on at this link too. You could win some of the nifty items mentioned in the book! What are you reading this summer? I'd love to know. 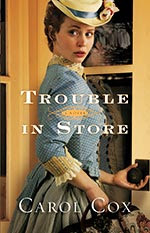 Tell you what...you leave me a comment telling me what you're reading this summer and I'll choose one commenter randomly to whom I will send my copy of Trouble in Store and a few of my favorite teas!